April 2014 - Department of English, Harvard University. I'm George Elliott Clarke: a poet first - all else second. By my roots - African-American, Indigenous, Nova Scotian/Africadian, Afro-Metis - I'm nourished, but not entangled; and I'm a citizen of the world, in imagination, if not in fact. I earn my daily bread as a professor and writer, but I've also worked as a library activities programmer; computerized traffic signals controller; parliamentary researcher; student newspaper editor; community newspaper editor; social worker; parliamentary aide; and, of course, as a professor, first at Duke University and now at the University of Toronto, but with guest gigs at McGill, UBC, and Harvard. As a scholar, I've pioneered the study of African-Canadian literature; as a writer, I've brought "Blackened English" to poetry, drama, and fiction. And I've coined the term, "Africadian." Drawing of Clarke, age 5.5, by his father, Bill Clarke, October 1965. Clarke, aged 20, at Three Mile Plains, NS, 1980. With poet Giovanna Riccio, University of Calabria, Cosenza, Italy, June 2017. With David Renton's student theatre company, Mind the Flowerpots,age 14, Halifax, NS, Fall 1974. In St. Petersburg (Russia), Summer 2007. 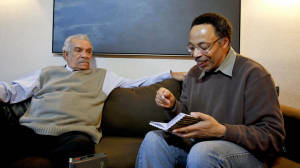 Clarke, aged 50, with Nobel Laureate Sir Derek Walcott, Victoria, BC, 2010. Testifyin', Paris (FR) January 2013. Toronto bus shelter poster, summer 2017. Clarke, aged 17, with brother, Bryant, Lawrencetown Beach, NS, 1977. With daughter AMC and Her Excellency Michaelle Jean, Governor-General of Canada, at Order of Canada appointment ceremony, Ville de Quebec (QC), October 2008. With daughter AMC, her mom JM, and poet Ama Ede, at ParliamentaryPoet Laureate official reception, Ottawa (ON), February 2016. With Ottawa Folk Festival Founder Chris White, in Halifax,(NS),recording The Afro-Metis Constitution album, February 2018. George Elliott Clarke was born in Windsor, Nova Scotia, near the Black Loyalist and Afro-Metis community of Three Mile Plains, in 1960. A graduate of the University of Waterloo (B.A., Hons.,1984), Dalhousie University (M.A., 1989), and Queen’s University (Ph.D., 1993), he is now the inaugural E.J. Pratt Professor of Canadian Literature at the University of Toronto. An Assistant Professor of English and Canadian Studies at Duke University, North Carolina, 1994-1999, Clarke also served as the Seagrams Visiting Chair in Canadian Studies at McGill University, 1998-1999, and as a Noted Scholar at the University of British Columbia (2002) and as a Visiting Scholar at Mount Allison University (2005), and as the William Lyon Mackenzie King Visiting Professor in Canadian Studies at Harvard University (2013-14). He has also worked as a researcher (Ontario Provincial Parliament, 1982-83), editor (Imprint, University of Waterloo, 1984-85, and The Rap, Halifax, NS, 1985-87), social worker (Black United Front of Nova Scotia, 1985-86), parliamentary aide (House of Commons, 1987-91), and newspaper columnist (The Daily News, Halifax, NS, 1988-89, and The Halifax Herald, Halifax, NS, 1992-2016). He lives in Toronto, Ontario, but he also owns land in Nova Scotia. His many honours include the Portia White Prize for Artistic Achievement (1998), Governor-General’s Award for Poetry (2001), the National Magazine Gold Medal for Poetry (2001), the Dr. Martin Luther King Jr. Achievement Award (2004), the Pierre Elliott Trudeau Fellowship Prize (2005), the Dartmouth Book Award for Fiction (2006), the Eric Hoffer Book Award for Poetry (2009), appointment to the Order of Nova Scotia (2006), appointment to the Order of Canada at the rank of Officer (2008), appointment as Poet Laureate of the City of Toronto (2012-15), appointment as Parliamentary [National] Poet Laureate (2016-17), appointment as a Fellow of the Royal Canadian Geographical Society (2017), and the receipt of eight honorary doctorates.